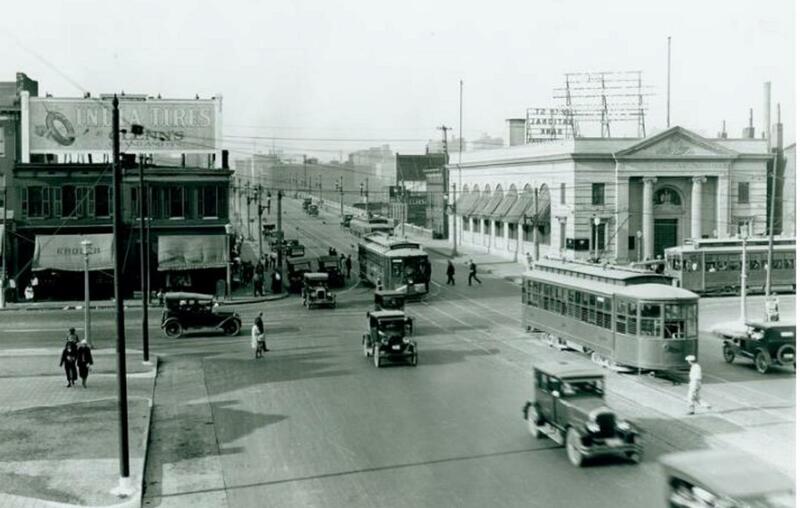 Today’s photo is of the intersection of Twelfth Street (Tucker) and Chouteau Avenue in the 1920s. This is just a stone’s throw from the drop off point of Metro’s special Mardi Gras Shuttle, running from 9 a.m. to 11 p.m. tomorrow. Click here for all of the details and have a wild (and safe) Mardi Gras! This is Tucker and Chouteau, right? The white building on the right corner still exists, but has been wrapped in ugly red brick. Dunno about the date – somewhere around 1920? Ooh, you beat me to it. Twelfth Street National Bank.